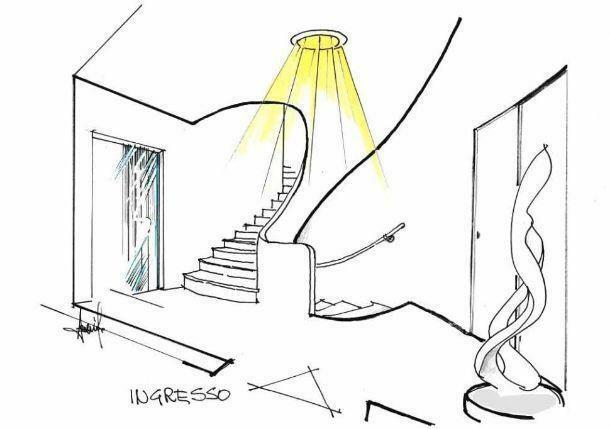 Freehand project for the entrance of a villa: the semihelicoidal set of stairs is highlighted by the light transmitted by the solar tube from the ceiling. Solar light: a futuristic technology evolving and perfecting literally allows you to bring the sunlight in any environment, even if it does not have a window. This is the so-called tube or solar tunnel, a revolutionary and ingenious device to capture the sun's rays and direct them where necessary, to provide soft lighting perfectly natural, albeit through artificial mechanisms and techniques of the last generation. In my freehand drawing I illustrate the entrance hall of a detached house on two levels. The sliding glass door, distinguishable on the left of the design, is the access to the living area of the residence. Front entrance, there are two steps uphill and downhill, which respectively lead to the sleeping area on the upper floor and to the basement garage. In refurbishing the interiors of the villa, I wanted to give a new figure on the two stairs through the creation of spectacular semihelicoidal curves that would give an optical illusion of upward momentum on the walls, optically widening the spatial perspective. At the same time, I decided to solve the problem of low light environment of the entire entrance and stairwells, as they lack of windows through which can penetrate the direct sunlight. In this situation, is a winner the adoption of the technology of solar tunnel: to this end, the floor slab night was a false ceiling to allow precisely the insertion of the channeling up to the roof of the residence, where to capture solar radiation. The floor takes on a semi-elliptical shape, then transformed into wall scale protection - feasible in lightweight concrete or reinforced plasterboard - which connects the sleeping area on the first floor with the living area on the ground floor. A handrail in steel tube fixed to the wall protects the staircase leading to the lower level of the garage. In this way, taken form an architectural layout of great scenic impact and has come to also create a broader perspective of natural light for the entire area of the landing entrance and along the two buttresses to go up and down. The massive entry of sunlight invades the environment, giving a considerable enhancement of the entire volume in all its dimensions, creating a magical light show that is also reflected on the sliding glass door through which you enter the living area. On the right side of the drawing, two sliding doors flush with the wall defining a combined cabinet coat holder, really practical to welcome guests at the entrance of the house. In the foreground, is proudly displayed a fine piece of design, you can now find the right place to shine thanks to the play of natural light, helping to give a tone of chic all'andito villa, almost like in an art gallery contemporary. The innovative technology of the solar tunnel is the result of Italian research of several leading companies, among which includes the brand Solarspot ®. The image in the photo shows a landing of communication between several rooms on the ground at night, according to the shape of the typical British residences; the solar tube was providential to give light to an area without windows. In other cases, as a result of extension of a kitchen, a living room or a bedroom, it happens that the window may turn away even more from the rest of the local open space and thus creating the so-called shadow cones. Other factors, such as the growth of protruding shafts or the construction of a veranda can be an important limitation for the entry of natural light in the house. The addition of one or more systems to solar tunnel can not only compensate for the loss of brightness, but also is able to provide it at an intensity of all exceeding expectations. 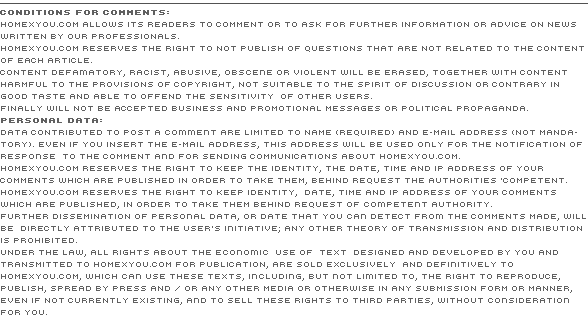 The movie company Lightway ® shows some of the countless fields of application of this unique technology. Furthermore, when the rooms are only accessible by road or from the walls, you can carry your light horizontally or even uphill, thanks to specific adapters corner. 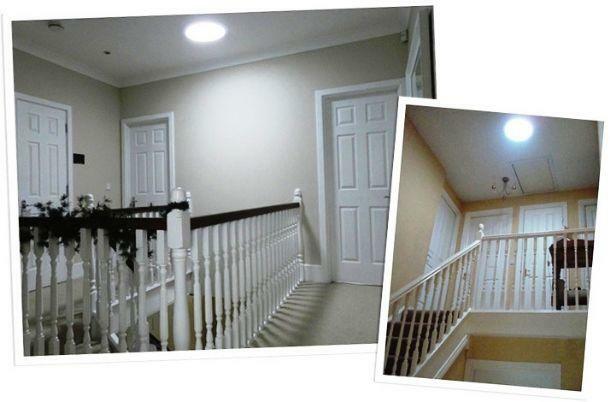 Therefore, in this article I showed you how achievable the magic of natural light thanks to a sophisticated technological device, which can add value to any residential or commercial space. In my project, an anonymous entrance took light but also charm and personality and as such the shining appearance of an elegant entrance hall with stairs to the exhibition plastic effect. Our exclusive online service for freehand design on Lavorincasa.it allows to redesign the interior and exterior spaces in new, strategic housing solutions that respond creatively and rationally the multiple needs in continuous transformation.